This picture was taken by 8 yr old Jack! The past couple weeks have been produced some fun fishing days along with some interesting weather. We have had massive amounts of rain which kind of gets our Snook going in the back country of Everglades National Park. There have Snook along the coast as well as the Whitewater Bay. Tarpon are still around although not I the numbers they were last month. Redfish were missing for a year or so but the last couple months I have been catching some small to slot size fish. Trout fishing has remained strong with fish up to 20 inches in good supply. SHARKS are abundant if you have kids they love them, they are big and nasty and put on a show. Government Cut still has some Tarpon around as well as assorted other fish. Jacks, Snappers, Barracudas, Yellowtails, and Snook can be caught during the summer months. The Snook spawn will take place the next few months so its a good time to get a big one! 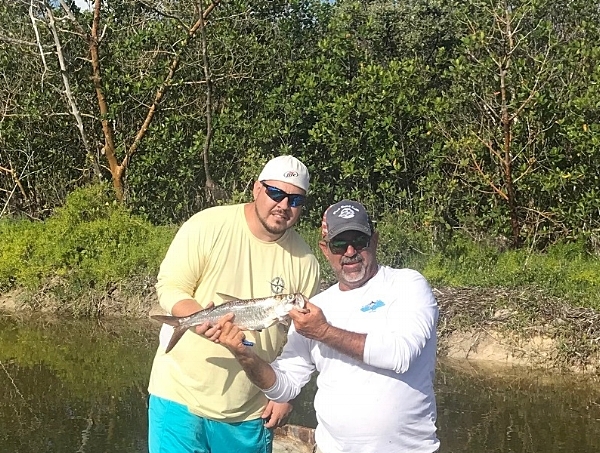 I fishing Flamingo with John Oriodan his son Jack and friends Rich and Conner Birch. We had a great day in the back country Tarpon, Snook, Redfish, Trout, Sharks. Conner had never caught a saltwater fish before his first fish was a 30 inch Snook caught on a Gulp Shrimp. His dad Rich caught his first Taron later in the day. 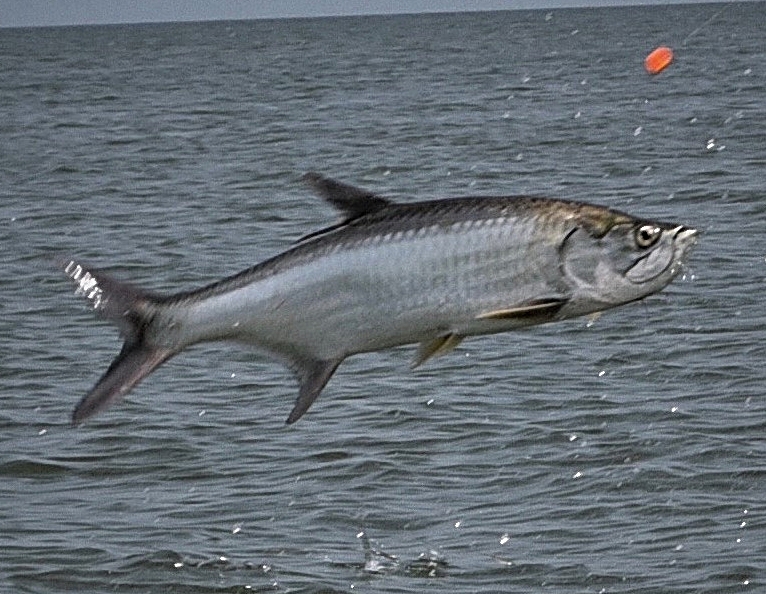 John had a great Tarpon which his 8 year old son Jack caught on film grey hounding out of the water. Boat Grand Slam today to much more to write about! I'm fishing Flamingo today with Halladale P.D. finest Matt, Casey and Leon. They Started the day off by catching a handful of small Tarpon.They caught Snook, Redfish, Trout, Sharks and a giant Sawfish. These guys were worn out and hungry. Great day another boat Grand Slam! I am looking for Tarpon tonight with Dan his son's Blake and Hunter. We were out catching mullet when it started to rain, for the next 2 hours we hid under a bridge. We finally made it to government Cut and got our baits out. It didn't take long and they were rolling behind us. First bite was a Shark which cut us off. The second bite was a possible Tarpon which came off. Hunter was jigging a Gulp Shrimp and getting hits on every drop. He landed Dog Snapper Mangrove Snapper Yellowtail and Jacks. I am fishing Flamingo with Ross and Mindy today. They are 2 of my favorite customers and enjoy every bit of Everglades National Park. It don't matter what it is as long as it pulls but he would prefer Tarpon. The bait schools along the beaches held plenty of fish today. They caught allot of fish today but looking for Tarpon I went against what had been working all week, getting tides backwards. We started out on big Tarpon first thing but it was sloppy and I had a couple guys motor around me so I just left. I ran around and today the lure that worked was an X -Rap. Ross thru this all day and caught Redfish and big Trout on it. Late in the day the Tarpon ate our Mullet but refused to get hooked. The Sharks on the other hand had no problem getting hooked up. Its hot and it rains some but the fishing is good. Its summer time so if you need to take your kids fishing give me a call at 305 333 8149. Ill keep them busy catching fish! Check out the Addictive Fishing show where I took Blair Wiggins Tarpon Fishing! Newer PostIncredible action in the Swamp! Older PostLots of fun Fishing!